Since its inception in 1999, the Asia-Pacific Programme for Senior Military Officers (APPSMO), organised by the Institute of Defence and Strategic Studies (IDSS) at the S. Rajaratnam School of International Studies (RSIS) has provided a unique and important forum for military officers and defence analysts from the Asia-Pacific region and beyond to network and exchange views on a broad range of subjects related to regional and international security. 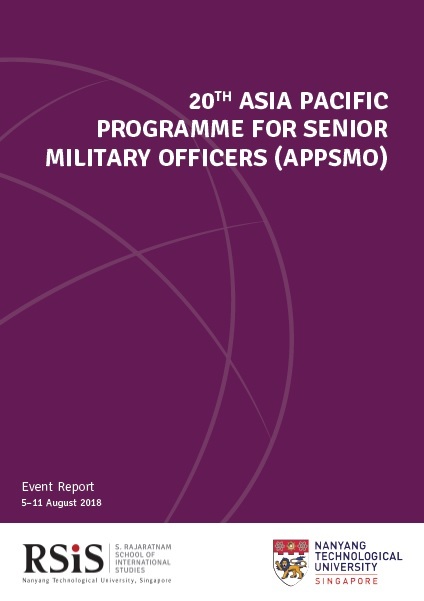 The 20th APPSMO, held from 5 to 11 August 2018, continued to facilitate defence diplomacy, with 48 military officers and defence planners from 20 countries in Asia, Oceania, North America and Europe attending. The theme for APPSMO 2018 was “ASEAN and the Asia-Pacific Security Order”. Key topics discussed included challenges and trends in the regional security order, the future of war and war strategy, terrorism, cyber and information threats, the shifting geopolitical landscape, and regional defence cooperation and confidence building measures. Apart from attending seminars and discussions, the participants visited the Regional Humanitarian Assistance and Disaster Relief Coordination Centre (RHCCC) at Singapore’s Changi Command and Control Centre, visited a frigate at Changi Naval Base, toured Clementi Camp, visited the regional headquarters of Microsoft, and undertook a military heritage tour of Fort Siloso in Sentosa and the former Ford Factory. On 9 August 2018, the participants and speakers dined at the NTU Alumni House, where they also had the opportunity to view a live telecast of the flypast segment of Singapore’s National Day Parade that featured combat aircraft, transport aircraft and combat helicopters from the Republic of Singapore Air Force, as well as the Red Lions parachute team from the Singapore Army. APPSMO 2018 continued to play an important role as an additional channel for defence diplomacy by facilitating learning and interaction among senior military officers in and beyond the Asia-Pacific region.